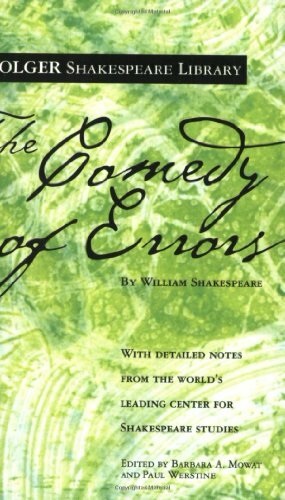 Amazon.com description: Product Description: Shakespeareâs The Comedy of Errors is the slapstick farce of his youth. In it, the lost twin sons of the old merchant Egeonâboth named Antipholusâfind themselves in Ephesus, without either one even knowing of the otherâs existence. Meanwhile, Egeon has arrived in search of the son he thinks is still aliveâand has been sentenced to death for the âcrimeâ of being from Syracuse. To add to the confusion, the two Antipholuses have twin servants, both named Dromio. As the four men unwittingly encounter each other, the play is crammed with wildly escalating misunderstandings before the truth emerges and Egeon is pardoned. Shakespeare bases his story on Plautusâs Menaechmi, a play about identical twins who accidentally meet after a lifetime apart. He borrows from another Plautus play by having Adriana, the wife of one Antipholus, entertain the other. The spirited Adriana often gives speeches evoking strong emotionsâas do other characters at times. Even here, Shakespeare suggests complexities beyond the farce. The Folger Shakespeare Library in Washington, DC, is home to the worldâs largest collection of Shakespeareâs printed works, and a magnet for Shakespeare scholars from around the globe. In addition to exhibitions open to the public throughout the year, the Folger offers a full calendar of performances and programs. For more information, visit Folger.edu.